On February 27, 2013 Access to Information Programme (AIP) presented the results from its audit on institutional web sites and the 2013 Active Transparency Rating at a press conference held at the Bulgarian News Agency. 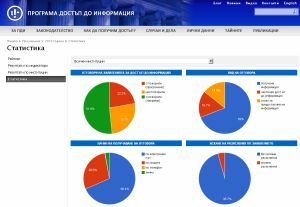 The aim of the audit, which AIP performs since 2006, is to evaluate how the executive bodies fulfill their obligations for proactive publication of information online under the Access to Public Information Act and other legal regulations and to assess their readiness to respond to electronic requests. 490 electronic requests were filed for a copy of the last public procurement contract signed by the institution in 2012. The level of transparency was evaluated on the base of 40 (43 for the municipalities) indicators. The possible total was 78.5 points. A separate Active Transparency Rating of the Municipalities in Bulgaria with a maximum score of 81.5 points﻿ was launched due to the three additional indicators for the local-government bodies. Results from AIP audit and the Active Transparency Rating were covered extensively by the media – 40 publications for a week. In the absence of a responsible public body to oversee, control and enforce the Access to Public Information Act, the Rating launched by AIP serves as a model publication scheme for public bodies. Analysis of the results, including findings and conclusions is authored by Gergana Jouleva, AIP Executive Director and is part of AIP annual report Access to Information in Bulgaria 2012. Comparative data from AIP audits 2010 – 2013 and 2013 Audit results by type of public body﻿ are available in English. The audit was performed within the project Responding to the New Demand for Freedom of Information supported by a grant from the America for Bulgaria Foundation.